In small bowl or plastic bag, combine 1/3 cup flour and paprika; mix well. Add veal; coat well with flour mixture. Heat 1/4 cup oil in 12-inch skillet over medium-high heat until hot. Add veal; cook until browned. Add 1/2 teaspoon salt, pepper and 1 cup water. Bring to a boil. Reduce heat; simmer uncovered 30 minutes or until veal is tender, stirring occasionally. 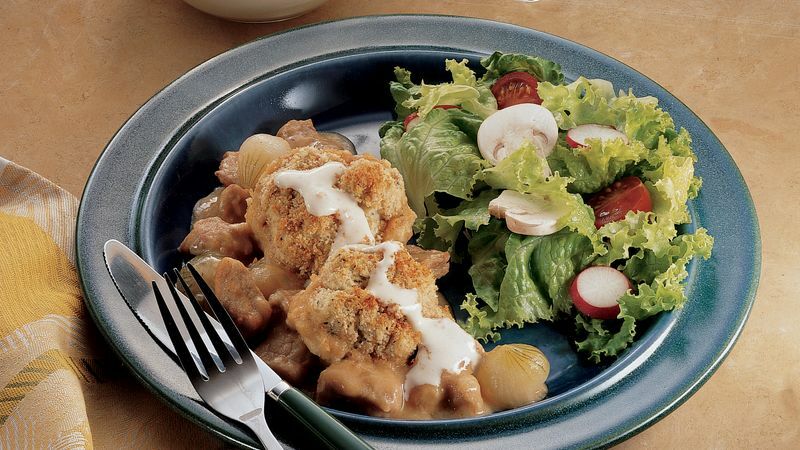 Transfer veal mixture to ungreased 13x9-inch (3-quart) glass baking dish or 3-quart casserole. In same skillet, combine 1 can cream of chicken soup and 1 1/2 cups water; blend well. Bring to a boil, stirring constantly. Pour over veal mixture in baking dish. Add onions; mix well. Heat oven to 425°F. In large bowl, combine 2 cups flour, baking powder, poppy seed, minced onion, celery seed, poultry seasoning and 1/4 teaspoon salt; mix well. Add 1/4 cup oil and enough milk so that, when stirred, dry ingredients are just moistened. In small bowl, combine margarine and bread crumbs; mix well. Drop rounded tablespoons of dough into crumb mixture; roll to coat well. Arrange dumplings over warm veal mixture. Bake at 425°F. for 20 to 25 minutes or until dumplings are deep golden brown. Meanwhile, in medium saucepan, combine all sauce ingredients; blend well. Bring just to a boil. Reduce heat; simmer 2 to 3 minutes or until thoroughly heated, stirring frequently. Serve sauce with casserole and dumplings.